Silica (or silicon as it’s technically known) is a completely natural, non-metallic element found in specific polysaccharide structures – especially our skin, hair and nails. 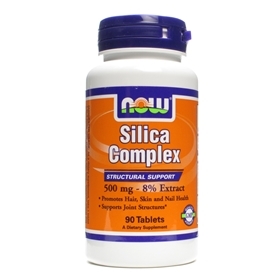 Derived from 100% horsetail extract and thoroughly screened for purity and potency, NOW Silica Complex is a unique, synergistic blend of nutrients that may improve the quality of these protein rich components, essential to natural beauty. People who want to make improvements on their appearance should consider silica supplements as this mineral helps support the collagen found in skin. By working with the collagen, silica can provide a more youthful and supple appearance while helping prevent the development of wrinkles. Taking silica supplements can also help improve joint function because it helps with strengthening the connective tissues that are found in the joints which in turn can also improve overall flexibility. Silica can even reduce swelling of your joints that are due to injury which in turn will allow them to heal more quickly. Additionally, taking silica supplements can increase a person’s cardiovascular health. That is because silica is an essential mineral for helping keep blood vessel walls supple and strong. It may even help clear up plaques as well as prevent heart disease.